Looking for Beach Wedding Ideas? Are you a bride in search of beach wedding ideas? Are you about as close to being Martha Stewart as Tony the Tiger? 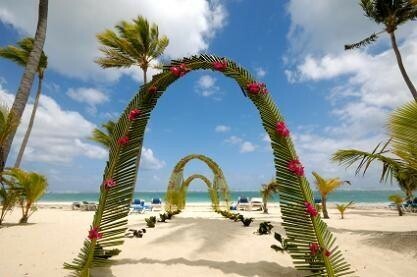 Okay, don't panic, a perfect beach theme wedding can still be accomplished, with style! You will absolutely wow your guests with just a few fun ideas, that are easy to create. To make it easy, lets break down the decoration process in a few quick categories. There are several, and you will want a clear-cut place to begin. This will also help you to feel less overwhelmed with it all. My first category is always the aisle, cause this is where the magic is about to happen. A few tropical touches can be great for a beach wedding, and centering your decorations around this general theme can lead to many great ideas. For example, use large tropical fruit to decorate your aisle, they can be hollowed out as vases and you can add tropical flowers for added beauty. Pineapple, coconut or papaya work very well, and as for flowers, hibiscus or peruvian lillies make great inexpensive choices and will work with most tropical beach wedding ideas. Use large tropical foliage to decorate as well. Ti leaves are broad and long and will make a perfect table skirt, and can be folded into your chair sashes. Use large tropical flowers-You can get lots more bang for your buck if you use larger florals. Luckily many tropical flowers are large and dramatic, like the Birds of Paradise, Proteas and Ginger flowers. Find more beach wedding ideas here! 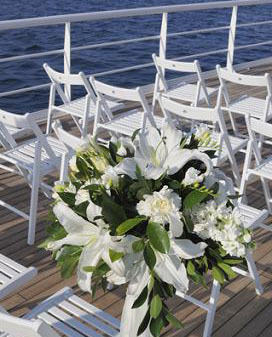 Thinking Nautical for your wedding? There are many things that you can use to decorate on the cheap, and still be fabulous in every way! Use Rope-a little rope strung between seats can make attractive aisle decoration. Use alone or accent with flowers. Stake with wooden posts or clip light-weight rope to chairs. Use Fabric lavishly-Striped blue and white fabric or other Nautical inspired fabric prints make beautiful table coverings for your gift and buffet tables. Netting can be used for decoration as well. It makes a lovely backdrop, and you can attach flowers in your wedding colors. Don't be afraid to be creative. Take full advantage of the beautiful colors of the ocean, and use that as inspiration for your nautical beach wedding ideas.